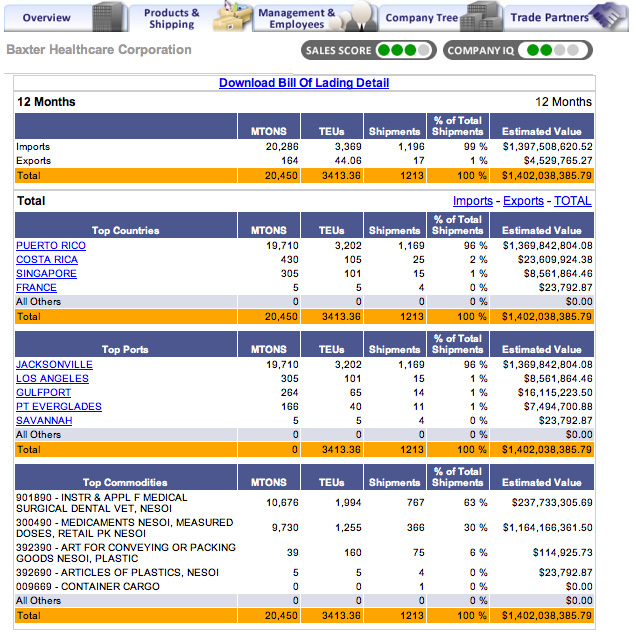 Their Corporate Website declares that Baxter is, “A leader in healthcare for 80 years”. Baxter assists healthcare professionals and their patients with treatment of complex medical conditions. Baxter is a global medical products and services company with expertise in medical devices, pharmaceuticals and biotechnology. Baxter has approximately 47,600 employees worldwide. Baxter is a publicly traded company whose stock has significantly risen recently going from $40 to over $60 within 1 year. To those who could have accurately predicted such favorable results, a pot of gold would have been the result. Even though there is no crystal ball, trade intelligence may be part of the key to unlock and predict valuable insights into a company’s future performance. How? By monitoring and evaluating their import and export activities. Let’s see what we can discover. $1.4 billion in imports mostly from Puerto Rico. Why is this important and how could it benefit a financial services professional? What if there was a natural disaster such as what recently happened in Japan or a political issue that arose in a supplier’s country? Obviously, this would impact the U.S. based company who depends upon such supplies. This type of data could be used to more precisely monitor and evaluate the nature of the impact on the inventories and potential future performance of the U.S. manufacturer/retailer. No Trade Intelligence provider thus far has established a viable dashboard for fund managers. However, it has been the subject of much in-depth discussion you can be sure. Several of the TI Providers – PIERS, Datamyne and Zepol have established “alerts” which can automatically notify users of new shipments or changes in sourcing patterns. It is not an exact science, there are only bits and pieces. The point is, if you put enough bits and pieces together and apply painstaking detective work and technology, patterns begin to emerge and a more complete picture can be drawn. The applications are numerous. One of which may be an intelligent solution developed for the financial services industry. 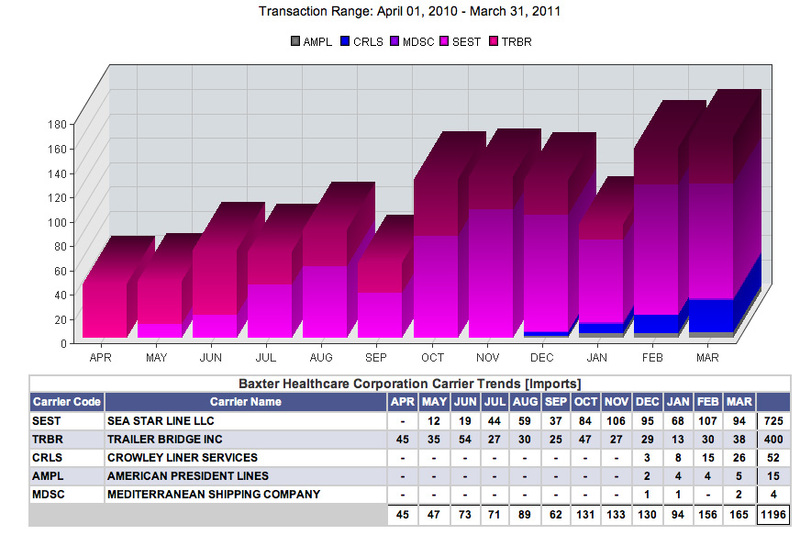 As a sample, please feel free to download and review details of 1,200 import transactions performed by the Tennessee branch of Baxter Healthcare over the last 12 months. Ti Provider, Import Genius, also recently offered up some information on Baxter. Click to see.